Burgess tell me that a whopping €7.6 million has been sliced from the price of the 90.1m motor yacht Nero, a joint listing with Merle Wood & Associates. Nero was built in 2008 in China, with her owner responsible for the exterior styling and interior design. He took as his inspiration the famous ‘Corsair’ series of superyachts owned in the early part of the last century by financier JP Morgan and the result is a modern classic. Built to Lloyd's class and MCA compliant, Nero accommodates 12 guests in a master, VIP, two doubles and two twin cabins and has a range in excess of 5,200 nautical miles at 12 knots. She recently completed a comprehensive winter maintenance period in Imperia, where upgrades include the reconfiguration of the aft suite to a full sixth stateroom, replacement of carpets in the guest areas, complete engine room repaint and further routine maintenance throughout. Nero was the winner of the Best Motor Yacht over 75 metres at the 2009 ShowBoats International Design Awards. 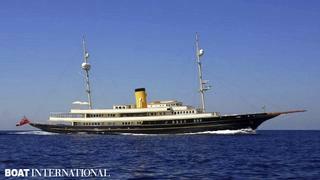 Currently located in Imperia, Nero is now asking €59.9 million.